BeautyBigBang . Manicure . Nail Art . Nail care . Nail Polish . Review . Tools . I have recently started experimenting with soak off nail polish, which you need to cure with a LED/UV lamp. I really liked the fact that the manicure lasts so much longer than regular polish, but I find the removal kind of a pain in the rare end. Honestly, soak-off gel, does it mean you have to dip your fingers in pure acetone and leave them to soak for a few minutes... can you imagine what this could cause to the skin around your nails? Well, then there is one other method: the foil wrapping. Instead of dipping your fingers in pure acetone, you cut off several squares of aluminium foil and put aceton an small pieces of cotton that you lace on your nails and wrap each of your fingers individually (to prevent the acetone from evaporating). This is the method I was using, but it is quite a hassle. Cutting off the pieces of foil takes time, then, once you open the foils, if the nails need more soaking, you try to wrap them again but the foils don't really adjust the second time. They are not good for multiple uses and you have to throw all that and restart again, generating a lot of waste! When silicon soak-off caps first came out I thought they wear totally gimmick. But back then, I never used to wear soak-off gel. Now that I do, I think they are a great invention!! 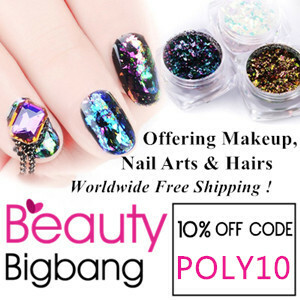 The ones I got from BeautyBigBang Store are very flexible, long enough even for long nails, and the ones I chose are PINK ♥ (there are other colours) with a little flowery detail embossed, they are really cute. They are also really easy to use. Basically there are two ways these can be used: you can place your cotton pad (damped in acetone or remover) over your nails and then put the cap on or you can open the cap (simply fold back the border as shown in the picture of the packaging) place your damped pad inside and then apply to the finger. If you have thin fingers you can get away with the first method (as you can see on my pictures) but if your fingers are a bit larger you'll find it more practical to follow the instruction in the back of the packaging. My nail polish need to be removed!! I place a piece of cotton damped in nail polish remover (or acetone) on my nail. After 5 minutes I remove the silicon caps. I press and swipe forwards the piece of cotton and ALL the polish is removed at once! As you can see this method is super fast, you need very little remover, and it generates very little waste! The Silicon Soak-Okk caps come in a package with 5 units in different colours (white, light pink, balck, purple and hotpink colour) and they retail at BeautyBigBang store for 4.59 USD. You can purchase it here. Do you wear soak-off gel polish? Did you know Silicon Soak-off caps ? Have you used any similar method? what was your experience? I'm curious, let me know all in your comments! !